The unique Gazebo Inn located in the center of the famed Branson Strip. Tucked into a secluded location immediately just off the center of the famed Branson Strip, the 73 room Gazebo Inn provides a unique lodging experience. Its inviting, warm, quaint and distinctive exterior is an indication, to incoming guests, of the wonderful lodging experience that they will have. Stanley Merriman, the Inn’s General Manager said, “Staying at the Gazebo Inn is a special way to experience Ozark’s hospitality.” He feels that special experience comes from exceeding their guests expectations through a combination of things. These include very reasonable prices, location, its relatively small intimate size, secluded safe quiet environment, quality and cleanliness of its rooms, a large continental breakfast, and the quality of staff and the services they provide to their guests. One of the spacious standard queen bed rooms. Merriman points out that every room in the hotel has been completely renovated, with new carpet, painting, new flat screen TVs, and more, within the last 12 months. The Inn has a great choice of rooms ranging from their standard king and queen rooms, to rooms with whirlpools, Honeymoon suites with an in room Jacuzzi, and a family suite with its own parking space near the pool. All the Inn’s rooms are non-smoking and a limited number are pet friendly. Standard amenities include in room refrigerators, coffee machines, hair dryers, irons, ironing boards and free wireless internet. The Gazebo Inn has an outdoor pool. While having no indoor pool, it’s located near its “sister” property, the “Grand Plaza Hotel” which provides complimentary access to its indoor pool and other amenities not available at the Gazebo Inn. 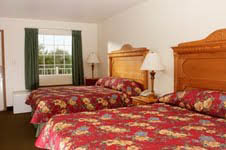 The Inn is ideally located in the center of the Branson Strip. It’s within walking distance of a number of Branson’s finest shows including those at the Andy Williams Performing Arts Center and Theatre and the King’s Castle Theatre. The fabulous shopping available at the Tanger Outlets and the Grand Village, as well as many Branson attractions and restaurants, is but moments away. 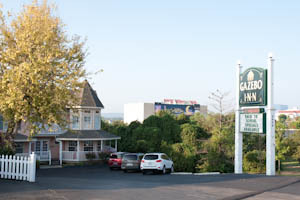 Merriman also said that the Gazebo Inn is part of the Branson Tourism Center’s Lowest Rate Lock Guarantee Program. What that means is that if you book your room through the Branson Tourism Center now, and find a lower price for the same room on the same dates before you arrive in Branson, the Branson Tourism Center will match it. “The Gazebo Inn provides our customers with a great Ozark’s lodging experience,” said Preston Garrison, Director of Operations for the Branson Tourism Center. For additional information or reservations for the Gazebo Inn or any of Branson’s other shows and attractions please contact the Branson Tourism Center (BTC), one of Branson’s largest and most respected vacation planning services. BTC can be reached by either calling their toll free number 1-800-785-1550 or through their website www.BransonTourismCenter.com. This entry was posted in Branson Lodging, Featured on April 3, 2017 by Gary Groman.